Ocean variability — the perpetual changing of currents, temperatures, salinity and the contours of the seafloor — alters the way sound travels through the water. A new analysis of how this variability affects sound waves could make it easier for Navy submarines to evade detection or for remotely operated underwater vehicles, like those used to combat the recent Macondo oil well spill in the Gulf of Mexico, to maneuver more accurately. It could also aid in basic oceanographic and climate research by helping to calibrate systems for using sound waves to measure ocean properties such as temperature and seafloor topography. The analysis was carried out by MIT researchers in collaboration with Taiwanese and Woods Hole Oceanographic Institution scientists. 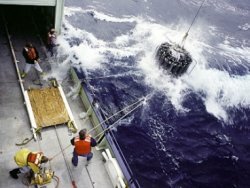 Using both theoretical computer models and on-site experiments off Taiwan and Kauai, they found unexpected changes in the way ocean and sound waves interact when they are emitted near the edge of a continental shelf, where the average slope of the seafloor changes abruptly. For the first time, they were able to make integrated ocean and acoustics predictions of how sound waves would propagate at a given time and location, and of the degree of uncertainty in those predictions, and then verified those predictions with actual acoustic measurements. Pierre Lermusiaux, the Doherty Associate Professor in Ocean Utilization in MIT’s Department of Mechanical Engineering, who led a research team that also included several of his students and group members, says the continental shelf area is becoming ever more important. That’s because such regions are increasingly being exploited for oil and gas drilling, and also used for naval operations by submarines from various nations. They are also most relevant for assessing the health of the oceans and climate dynamics. As a result, he says, “a lot of research interests are now focusing on the complex shallower seas and their interactions with the deep ocean.” The results of his research, which was funded by the Office of Naval Research, were published online on Nov. 30 in the IEEE Journal of Oceanic Engineering. The research predicted and explained how sound waves used for sonar imaging and for underwater communications can be affected by the interplay of large-scale currents, eddies, internal tides, the irregular topography of the seafloor, and other factors, and demonstrated where and when each can be a key factor in predicting how the sound waves will travel The analysis should make it easier to forecast how beams of sound waves will be affected; such an ability should improve the accuracy of communications and the computer reconstruction of sonar images used to detect submarines and other objects or to study the seafloor, as well as ocean dynamics in general. “We’re just trying to advance the science and technology,” Lermusiaux says, by creating computer models and data-driven estimation methods that can aid in understanding and forecasting both the ocean and acoustic conditions in a given ocean region for several days ahead, thus facilitating the optimal planning of scanning or communication operations in that region. In addition, he says, some researchers including MIT colleagues have suggested that measuring the propagation of sound waves over long distances in the ocean could give researchers the ability to monitor the effects of climate change because it would allow them to help determine ocean temperatures and circulations over large regions. Better understanding and prediction of diverse ocean dynamics and how they affect sound waves could be important for such measurements, he says. Nadia Pinardi, professor of oceanography at the University of Bologna, Italy, says, “This paper confirms unequivocally that ocean acoustic uncertainties are connected to a detailed knowledge” of the ocean features and processes at the specific location and time. She adds that “these results could pave the way for new acoustic applications” in underwater imaging and communications. Arthur Miller, a research oceanographer and senior lecturer in climate sciences at the Scripps Institute of Oceanography in San Diego, says “The shelf-slope system that [Lermusiaux] considers here is extremely complicated with irregular bottom topography, strong horizontal currents and fast internal undulations of the water column, that can each influence the predictions of how sound moves through the water.” Techniques pioneered by Lermusiaux now make it possible to determine which factors are most important, he says, and thus improve the accuracy of predictions used for carrying out underwater measurements. “These results are critical for practical applications in sonar by the Navy,” Miller adds.